Our Uber 16oz balls are full-weight and full-size (9.2cm). These modern, long lasting composite balls are durable and provide excellent play. These are the balls that Uber supply with their top-end croquet sets. 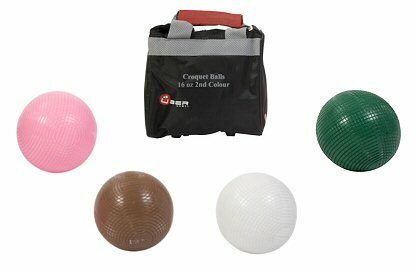 Along with mallets, croquet balls are the most important part of a croquet set. Get it right, and you will be able to really feel the shot, and appreciate fully the right "knock" as one ball hits another. The important thing to look for in a croquet ball is that it is of regulation size and weight (a regulation croquet ball must be 3 5/8" diameter, and weigh 16 ounces), as a ball that is too light or too small will not behave in the way it should do. Finding regulation size & weight balls is actually not as easy as you might think, and if you do find them, they are usually quite highly priced - until now that is. Our replacement balls are made from a tough composite material and will provide years of good service. We offer so-called primary colours (Red, Blue, Black & yellow), as well as the secondary colours (Pink, Brown, White & Green). We sell individual balls, or as sets of primary or secondary colours.